By Steve Consilvio (Page 1 of 8 pages) (# of views) No comments, In Series: Alternative Economics 101: Tax Your Imagination! 2. Who Owns the Money? When the Pilgrims arrived at Plymouth harbor in 1620, the English Civil Wars and the establishment of the Commonwealth of England would occur twenty-nine years into the future. The rise of modern finance was ninety-five years in the future. The first steam engine was hundreds of years away, and electricity a century after that. The Mayflower Compact, which was written before the Pilgrims touched shore, lays out a framework that embodies the virtues of a commonwealth. The word commonwealth means for the public good or general welfare. The idea of commonwealth is the basis of the society that we currently enjoy. The opposite of commonwealth is fascism, where the strong bully the weak and the many serve the few. Fascism and slavery are evil twins. One is generally regarded as a political term and the other as an economic term, but they hold in common the idea of the few taking advantage of the many, and a top-down society. 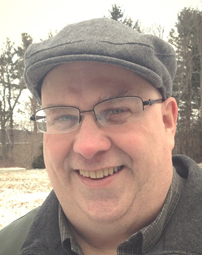 Contrasting world-views of commonwealth and fascism are still common in society. This is a primary dissonance. Fascism can easily become part of any hierarchal relationship, regardless of the organizational type. A family, business, church or government can be headed by a merciless autocrat, whose hand on the rod of law is swift and heavy. Fascism, in part, drove the Pilgrims to flee Europe. Fascism was part of the colonization of the world that followed. The world's most famous fascist was the Pharaoh of Egypt. Whether or not you accept Moses, the evidence of an Egyptian empire still stands. Empires always have fascist characteristics. Empires are highly stratified, authoritarian and plunder-driven organizations. Commonwealths are based on a belief that all men are equal, but invariably set up some form of hierarchal authority. In a commonwealth, we have a shared responsibility toward one another and a moral duty to the next generation. The wealth of society is shared for the enjoyment of all. The concept of stewardship extends to the whole next generation, not to the royal inheritance for a narrow familial advantage. The words republic and commonwealth share the same meaning. The United States of America was formed as a republic, and overthrew the tradition of monarchy, but the idea was planted one-hundred fifty years earlier by the Pilgrims. The idea that "All men are created equal' was part of a continuing search for a just society, where the few did not take advantage of the many. The problem of how shares get distributed, and who makes the decision, is the role of politics. The new commonwealth in America quickly fell prey to old European habits of authority. Those in power see the sacrifices of others as natural and necessary for order. There were complaints about taxation as early as 1632. The people of Watertown, Massachusetts did not want to pay for a fort in neighboring Cambridge. The fort sheltered the soldiers, not the people, and antagonized the natives. It did not offer them any protection, and made the colonists poorer. They demanded a vote, which is fondly recalled by the townspeople as the first demand for no taxation without representation in the new world. One hundred and fifty years later, the same colony would contribute willingly to buy arms for their own fledgling government. The arms stored in Lexington were viewed as an act of disobedience by the colonial government. Reluctant subjects were transforming into adversaries. In the aftermath of "the shot heard around the world,' (1775) Paul Revere would flee Boston and would hide in Watertown, where one of his duties was to print money! Politics are often about somebody being afraid of something, and of wanting a law to placate their fear. Violence, money and laws have a long sordid history. It is the nature of fascism to take too much, and then to demand more to protect what was taken. The more imbalanced the society becomes, the more the imbalance compounds, until the few have all, and the many have nothing. Fear masquerades as commonsense. The rebel becomes as illogical as the authority he opposes. All violence is fascist. The rebel, in setting himself up as a champion, expects others to serve his needs, too. Trust and diplomacy are regarded as weak and dangerous on both sides. Both sides would rather kill their adversary and destroy their wealth, than share their wealth and live in peace. War is consumptive like a fire. Lives, labor and material wealth are exchanged for a heap of ashes. Series: "Alternative Economics 101: Tax Your Imagination!" 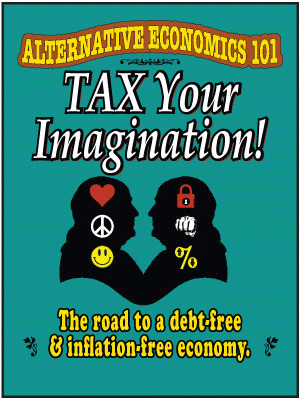 View All 16 Articles in "Alternative Economics 101: Tax Your Imagination!" 14. What is Modern Finance? 8. What is the GDP/GNP? from Alternative Economics 101 - Tax Your Imagination! The National Debt is the inverse of the profit/inflation in the private economy. What are Boom and Bust? Alternative Economics 101 - Chapter 5: Tax Your Imagination! Alternative Economics 101 - What is the Cost of Living? 9. The National Debt is the Inverse of Inflation - from Alternative Economics 101 / TAX Your Imagination!